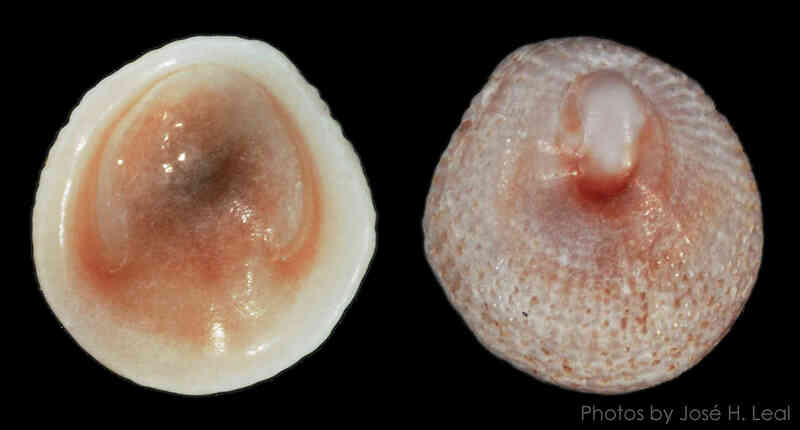 The Orange Hoof Snail, Hipponix subrufus (Lamarck, 1822), has a cap-shaped shell that grows up to 12 mm (about 0.5 inch). It has a reticulated sculpture of concentric ridges crossed by radial cords of about same size. The shell inside has a horseshoe-shaped muscle attachment scar. The shell color is usually light orange-brown. Fresh specimens have a thick, light-brown periostracum. Hoof snails live attached to hard surfaces, and are frequently found on the shells of other mollusks. The shell in the photos was found by Barb Hansen near Gulfside City Park on Sanibel.